This anime is about Black Jack during his younger days. In his regular anime, Black Jack is an extremely talented doctor without a license that asks for expenses fees. Young Black Jack will have episodes where someone gets hurt or stuff that involves politics and it all comes down to Black Jack saving someone. I can't tell you how much better the Black Jack anime series is without Pinoko! She is a little parasite that is not missed. It's rather refreshing to not see Pinoko at all. And the opening song to this anime is AMAZING. If you aren't going to watch this anime you should at least give the opening song a try. Glad I found the show... great animation! It was really good! I was surprised, I just kind of stumbled into it... I'm going to try to watch some of the original now but I think it will be difficult because the animation in this one was so good. Give the first episode a try... everything about it is great! This is a great introduction to this surgeons early life; before he became the well renowned doctor I pretty much fell for from the OVA's and earlier works. I personally enjoyed it because I like medical drama's. animation is great, story is great, just enjoy the ride and if you like it yay! if you don't..oh well. As an extremely critical long time fan of the original series, I find this to be a decent addition to the Black Jack series. References to the original series, and even some of Tezuka's other works are appreciated, I was very afraid this anime would turn out to be a super fanservice-y waste of time. Pleasantly surprised to find a serious and true-to-character imagining of Black Jack's time as a student. Not as dark and dramatic as the 90s OVAs, and not as lighthearted and kid-friendly as the 2004 anime, this one was a good in-between, much like the original manga. While I enjoyed it, I wouldn't say I 5-stars-loved-it, with how over the top fanservice-y it can be at times. (seriously, he is shirtless at some point in nearly every episode?) Not to mention some minor instances I found him out-of-character, aka dishing out his ~tragic backstory~ at the drop of a hat. BUT- these are forgivable offenses. In the end, I'd say worth a watch for both fans and those new to Black Jack. This was a recommendation since my friend loved Blackjack, I've seen some of the other and I really liked this one. It gave a nice story to what had happened to him and his life prior being where he is. I liked all the supporting characters that brought a good dynamic to the show. Amazing!! They should remake the original! I absolutely love the animation style and main character designs! The series was very heart wrenching and emotional. I was sitting on the edge of my chair the entire season! I really hope they remake the original Black Jack series with the same animation! young black jack is one of my favorite anime's to come in the past year or two. It somehow takes a rather uninteresting idea for an anime and somehow makes it interesting. The fact that i actually enjoy watching him perform surgeries actually surprised me at first. I do not know how i feel about the "villian" that has been introduced, but i have thoroughly enjoyed first ten episodes. All around i really like the setting, "action" scenes, and the character development has been okay. Therefore i would rate it pretty good for a newer anime. DISCLAIMER: written after I viewed all episodes, and also it must be said that I have read the original manga and watched the 2004 anime adaptation. To be fair, if CR could do half-stars I'd honestly give this 2.5; but, since I have to choose one or the other...I hate doing this to one of my favorite classic characters, but in this case I'm gonna round down. Why? 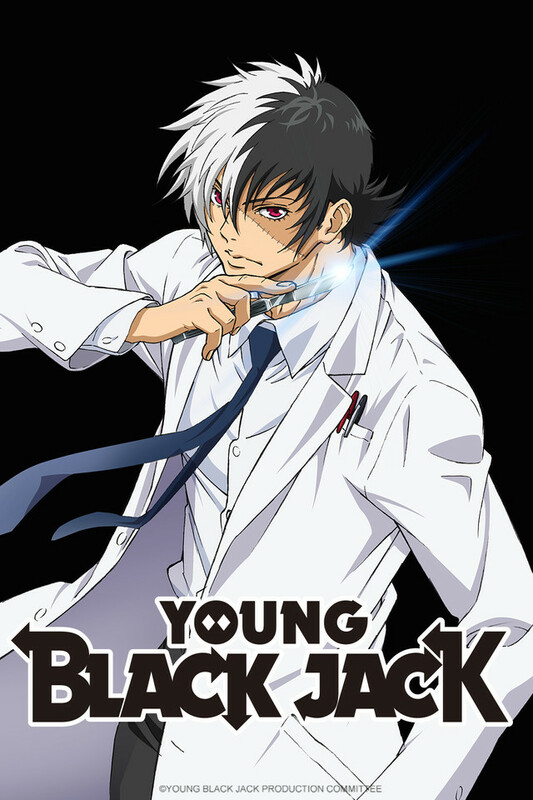 I suppose because Young Black Jack just wasn't what I was expecting, nor did it really live up to my expectations. It must be said however, that I am biased since I loved the original series; and when you announce a prequel based off one of Tezuka's most famous properties, I'm gonna have high expectations. I wasn't thrown off by his new pretty-boy looks, or the manservice-melodrama angsting; I was okay with those. What I feel is that this series never really seemed to do much in terms of advancing both Black Jack's past as Kuroo Hazama, or developing his character at all throughout the 12 episodes. Like, the episodes just feel mostly...episodic, but trying-too-hard-to-connect-into-an-overarching-plot. There are lots of mini-arcs throughout, and some were better than others, but overall, there seems to be nothing tying them all together??? I still don't understand how these events really lead him to turn into Black Jack--okay, it's probably easy enough to assume that he just simply becomes disgusted with the bureaucracy of the medical field, but we shouldn't have to make assumptions--I was expecting the show to delve more into his past (like how he hates his father for abandoning him and his mother after they are nearly killed by the landmine), and how certain events--like the Vietnam War, racial discrimination, etc.--influenced him. But it just always seems glossed over and we're supposed to assume it turns him bitter...but it's not obvious. Likewise, characters that appeared a lot in the beginning seemed to disappear by the end; Maiko, his senpai (and whom I thought would play a bigger role) and Yabu, I would've liked to see more of them. Instead, there seems to be an endless stream of Tezuka cameos--which are really fun, don't get me wrong, but I wish we didn't have to sacrifice some of the major secondary characters just to play 'see how many Tezuka character we can cram into a single show'. I am also not very sure of how he is connected to some of the others--like the shady black market dude. It seems implied that Hazama owes him but this is never really explained...(unless this was covered in the original manga and I've forgotten). Hazama himself is interesting, but I wish we had more development of how he gradually becomes jaded with his world; at times I feel like there is a severe disconnect b/t his 'must save everybody' and his older self's callousness and charging exorbitant fees. I don't see how all these events cause him to turn into what he becomes. Aesthetics-wise, this series is quite pretty--the designs are a nice mixture of the modern attractive characters and nice throwbacks to Tezuka's original style; Tezuka Productions also knows how to animate quite nicely. The BG music is only average, but I liked the OP/ED songs a lot. However, there's too little actual medical operating/stuff for a series that is a medical drama, although I suppose if you're not a fan of blood/the human body, it might make for some easier viewing. Still, I feel that the operations in this series somehow lack the weight and tension that the original manga had; and none of them really seemed to tread the find grey moral zones that the original was so good at. I suppose at the end of the day, I simply set my bar too high; but for me, Tezuka's works are still among the highest and I will expect quality when seeing anything adapted from his works. I was pretty excited at first, but by the halfway point I found myself not really caring; which is never a good sign. If you're a fan of the classic Black Jack, you may want to just skip this and watch the 2004 remake or simply watch it with a grain of salt; however, if you haven't been exposed to Black Jack or any of Tezuka's works before, this is an okay entry point, although many of the cameos and subtle hints of what he becomes may be lost.